Classic Chinese treats transformed into Valentine's Day fortune cookies with some dipped dark and coloured chocolate for a decorative touch. Plus, hilarious love quotes from the iconic F.R.I.E.N.D.S TV show are hidden on the inside which make these so much fun to open! 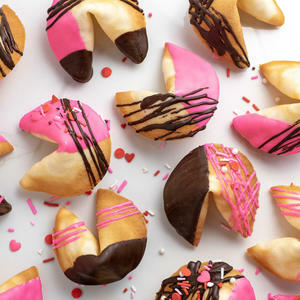 Say it like you mean it with these valentine's day fortune cookies!